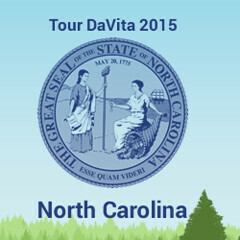 The Green Girl is updating The Green Girl's Tour DaVita Packing List in preparation for Tour DaVita in North Carolina next month. I pack each day's outfit in a separate gallon zip baggie and then seal up the dirty outfit in the same baggie. You will need some sort of bag with a handle/loop so you can hang it from a hook for carrying everything to the shower and hanging it while you shower - I'm using a mesh beach bag. Sleeping pads and sleeping bags will be provided so I plan on using the secondary sleeping bag as additional cushion. I absolutely swear by the Huggies Natural Care Baby Wipes Clutch and Clean Carrying Case because I can loop it around my wrist and easily hang it in the porta-potty. One item I omitted from my packing list which might be useful is an extension cord for charging electronics since the charging stations tend to get crowded. For cold mornings, stash your outfit in your sleeping bag before you go to sleep so you have warm clothing to put on when you wake up. Don't leave electronics or anything you don't want to get wet on the tent floor because condensation tends to accumulate over night. I would recommend not taking a CO2 cartridge onto an airplane due to increased security - I used to carry them with me but I no longer do this.